Whether you are a first-time buyer or an existing property owner, you might be thinking about buying an investment property. But what should you look out for when financing your investment property? If you’re not prepared, or you don’t get appropriate advice, you could ultimately lose out. 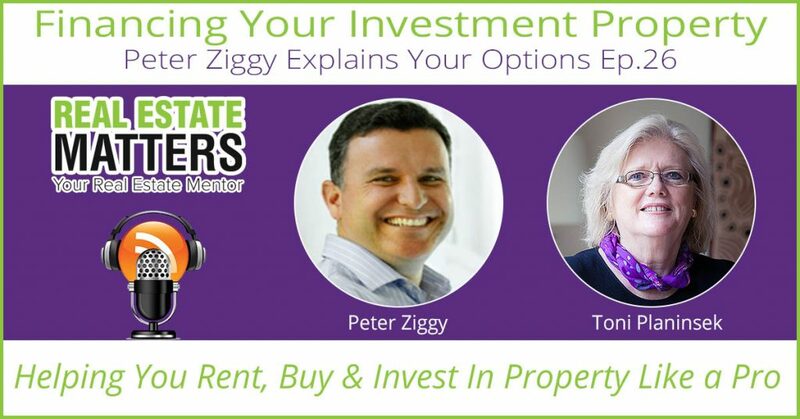 In this episode of Real Estate Matters, Toni interviews Peter Ziggy, CEO and founder of 3P Financial – a niche, boutique financial services provider. They discuss whether it’s better to invest first or buy first, the best methods of financing your investment property, and what to consider when taking financial advice. This episode is key for anyone who is considering financing an investment property. You’ll learn why it’s important to choose the right financial adviser, what kinds of buffers you should plan for in your investment cash flow, and why you may want to put off buying your own home in favor of an investment in the short term. Peter Ziggy (“Ziggy”) is the CEO and founder of 3P Financial, a niche, boutique financial services provider. 3P stands for a “Passion for People to Prosper”, and the company offers advice on accounting, taxes, property investments, wealth generation and more. Ziggy’s goal is for all his clients to achieve the financial independence they desire. Ziggy started as an accountant in 1990 and successfully practiced for 12 years before moving into financial planning. He currently holds both CPA (certified public accountant) and CFP (certified financial planner) qualifications. Peter Ziggy is also the author of “Money Does Grow on Trees”, available now from his website, or on Amazon. What qualifications should a financial planner have? Is it better to buy an investment property before buying your own home? Should you be financing your investment property by borrowing against your existing equity? What should you look out for when choosing a financial adviser?